Norbian has just announced that it will now be distributing the Discover range of bullet cameras. The Discover range is the American Dynamics 200 and 600 series bullet cameras that come complete with built-in IR illumination. The dome range surveillance cameras are available now for purchase via Norbian. The Discover 200 Series bullet cameras feature backlight compensation as well as automatic gain, iris and white balance, built-in IR illumination and a 380TVL resolution. In addition to that, the Discover 200 Series of bullet cameras can also switch to IR illumination in low light situations automatically. The 200 Series indoor mini-dome camera includes a varifocal auto-iris lens equipped with a 3-axis gimble. 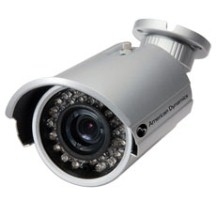 This camera is available in an 80mm or 90mm dome version, both of which feature a 480TVL resolution as well as a 1/3-inch CCD and 12V DC operation with 12V DC/24V AC available on the ADCD201 model. The Discover 600 Series bullet camera is almost identical to the Discover 200 Series bullet camera, though the Discover 600 Series bullet camera provides a 520TVL resolution as well as integrated IR illumination in an IP66 rated housing. All of these cameras are available now from Norbian so if you are in the market for average bullet cameras or mini-dome cameras, then head on over to Norbian and check out the Discover 200 Series bullet camera, the Discover 600 Series bullet camera or the 200 Series indoor mini-dome cameras from American Dynamics.